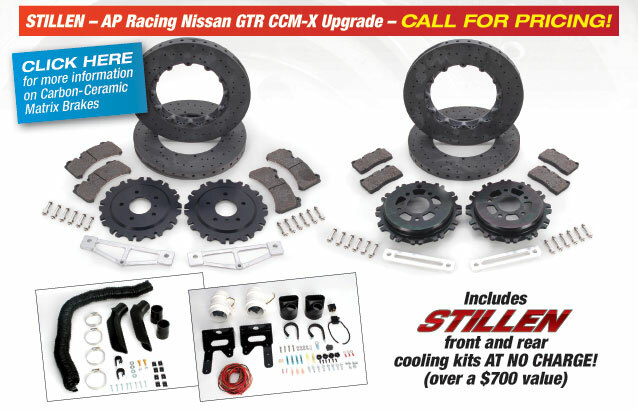 Free brake cooling kits with the STILLEN/AP Racing CCM (Carbon Ceramic Matrix) brake upgrade for your Nissan GT-R. 38 lbs lighter than the factory rotors. If you want to lose rotating unsprung weight, here is a great area. 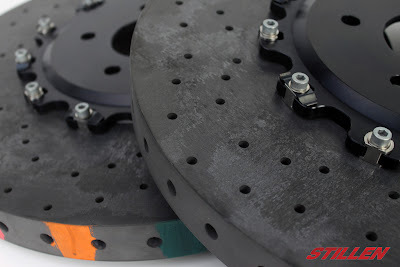 The ultimate brake upgrade for the Nissan GT-R, available for the 2009-2011(stock 380 mm) and 2012-2013(stock 390mm) cars is the STILLEN/AP Racing CCM-X carbon ceramic matrix brake rotors. 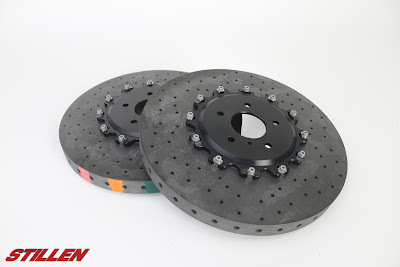 Once found only on the world’s most expensive supercars, Carbon-Ceramic Matrix (CCM) brakes have been developed for the first specifically-tuned aftermarket application – the Nissan R35 GT-R. These 400mm disc assemblies are 20mm larger than the standard 380mm OE iron discs, yet reduce weight by nearly half(38 lbs lighter than the stock brakes). This is rotating and unsprung weight, leading to improvements in all performance categories: acceleration, handling and braking. Wouldn't you like to lose 38 lbs of rotating, unsprung weight? After three decades of using carbon-carbon brakes on racing vehicles (even longer on fighter jets), AP Racing CCM discs are the next technological platform. Advancements in materials, process technologies and nanoparticle technology make it possible to use a special carbon fiber precursor along with new, patented process techniques. The unidirectional precursor is needled into a 3-Dimensional, continuouscarbon fiber preform. This differs from lower cost technologies that use loose, chopped strand fibers and thin woven face plies bonded on as a friction surface. A true 3D matrix is stronger, more robust and provides longer life than the more brittle alternative. As a comparison, think quality hardwood versus particle board or MDF with a veneer.